Brazil opens another energy front with new kind of biodiesel: "H-Bio"
Brazil is the world's pioneer and leader in ethanol production, but now it is also making a breakthrough on the front of biodiesel, a fuel traditionally more associated with Europe. 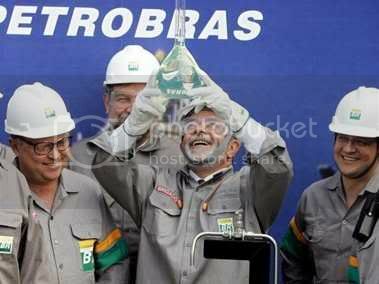 The country has started testing a promising new process for the production of biodiesel, developed by Petrobras, which consists of incorporating vegetable oils during the final refinery stage of petroleum distillates. This approach differs entirely from the conventional way of making biodiesel, that is, through 'transesterification'. The Brazilian process mixes vegetable oils with distillates (both diesel and benzene) in a process called hydrogen hydrogenation. The result has been dubbed "H-Bio" and makes for a biodiesel that contains less sulfur, is easier to produce, can be used in existing diesels in high ratio's, and is cheaper than classic biodiesel. Most importantly it does not require dedicated biodiesel factories, but makes use of facilities in existing petroleum refineries. This is a major breakthrough, and it propels Brazil a step forward into becoming the absolute champion of biofuels. Last year, Brazil had started large-scale production of traditional biodiesel using feedstocks cultivated by poor farmers in the Nordeste Province. The new H-Bio does not endanger this program, though, because it is said to be "perfectly complementary" with ordinary biodiesel. More info at Pleinchamp (French) and AFP (French).